Star Wars: The Last Jedi is available to own digitally in HD and 4K Ultra HD and via Movies Anywhere TODAY, and in 4K Ultra HD™ Blu-ray, and Blu-ray™ disc on March 27! 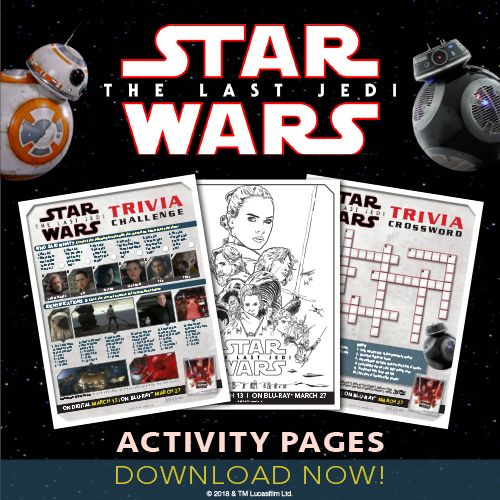 To celebrate the home release of the newest Star Wars flick, I’ve got printable activity pages to share! No compensation has been received for this post, but I am including Amazon affiliate links. That’s right! You can bring Star Wars: The Last Jedi home today! I loved seeing The Last Jedi in theaters, and I can’t wait to own it so we can watch it over and over at home! 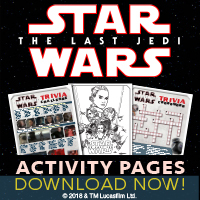 Click the button below to download Star Wars The Last Jedi Activity Pages! This release also marks Disney’s first title available on 4K Ultra HD Blu-ray disc in both Dolby Vision™ HDR and Dolby Atmos® immersive audio, delivering consumers a transformative viewing experience. >Deleted Scenes – With an introduction and optional commentary by writer-director Rian Johnson. We have not seen this movie yet. My son and grandsons are excited to see it. Thanks for the activity pages, my grandsons will love them.